In the previous article we saw some of the chart patterns getting formed over a period of time, i.e. in few months. 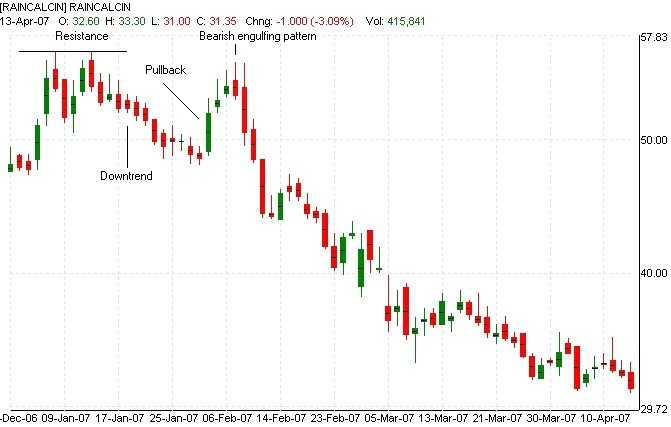 In this article let us disuss some basic candlestick patterns, which have been used by Japanese rice traders in the 17th century and still have lot of importance when judging the short term trend. In the figure shown above we can see a ‘white candle’ i.e. close is more than open. In the computer age, it is displayed sometimes as green, so we will call it a green candle. 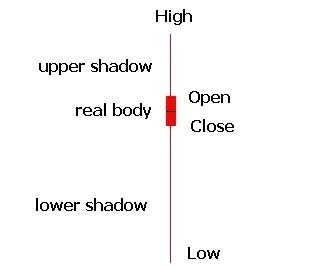 The line shown above the close price is called the upper shadow while the line below the open price is called the lower shadow. This explains the volatility during the session. The stock opened at a price, went to a low, bounced back to a high price and it managed to close at some other lower price but higher than the open price at the end of the day. The rectangular green box drawn between open and close is the true trading range of the session. The upper shadow above indicates selling pressure while the lower shadow indicates buying pressure. Long real bodies tell us that the buyers were in control; Long shadows show that the volatility was very high during the session. Note the length of shadows in previous figure and this one. Lower shadow is higher than the upper shadow while in the previous candlestick it was almost equal. Long white line: Usually a very long real body and small shadow(s) with close greater than open price. Long black line: As per above, but open greater than close price. Hammer: Body is between 1/10th and 1/3rd of the candle height and there is no upper shadow. Inverted Hammer: Same as above except that there is no lower shadow. Doji: Open price is same as (or almost same as) close, however, it is not possible to expect all stocks to close exactly at the open price all the time. So usually a tick or two will be permitted either way. The body should be nearly at the centre of the candle, and some tolerance is always given in this case too. 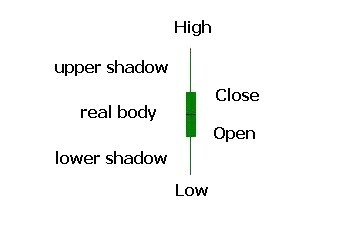 Dragonfly Doji: Same as doji and there is no upper shadow. Gravestone Doji: Same as doji and there is no lower shadow. Spinning Tops: These usually have small real bodies and centered around the middle of the candle. The real body is more than that of doji. Single candlesticks will depict the price action during a trading session. There are combinations of candlesticks or multiple candlestick patterns which are classified as either reversal signs or continuation patterns. There are bullish patterns as well as bearish patterns.Following are some of the most common patterns in Indian stock markets. 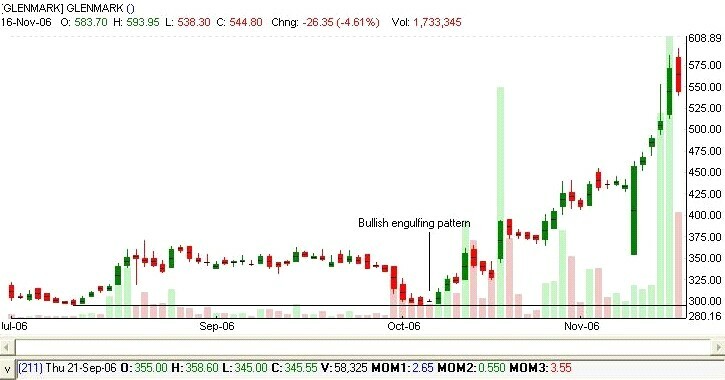 Let us discuss about the engulfing patterns in detail. The real body of the red candle is engulfed by the real body of the green candle; however, shadows of red candle may not be engulfed by the body or shadows of the green candle. The above classification is based on the order of importance. We may think of engulfing as an eclipse. What does this mean to the trading activity? In the previous article I mentioned, “During a corrective decline in a bull market, we can see declining volumes with declining prices.” Watch the volume decrease gradually with decreasing prices as prices fall near the support line. It is here the bulls enter the market. 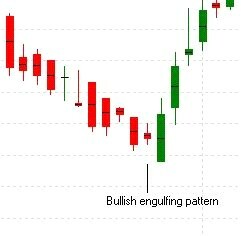 The bullish engulfing pattern was strengthened by a green candle and higher close on the next day (also called three outside up pattern). From a close of 299.80 on 06.10.2006 it managed to reach 571.15 on 15.11.2006 (almost 90% appreciation). It must be confirmed by a green candle and higher close on the next trading session. A red candle completely ‘engulfs’ the green candle as displayed in the chart. As in the case of bullish engulfing, bearish engulfing also has 3 classifications based on the order of importance viz. 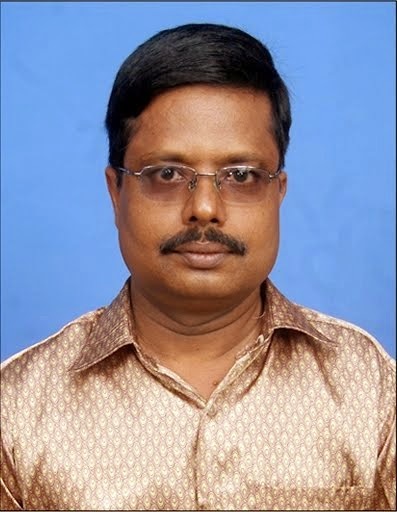 whether entire green candle is engulfed by real body of the red candle, or green real body and its shadows are also engulfed by red real body and its shadows respectively or shadows may not be engulfed at all. As evident from the above chart, the resistance level of 56.55 could not be penetrated by the stock and a downtrend starts. At the end of the pullback rally sellers enter the stock and vigorous selling starts. This is followed by more selling and stock manages to hit a low of 31 or about 45% fall from its high. The bearish engulfing pattern is confirmed by a lower close and a red candle on the following day. Potential reversals are many times identified by bullish and bearish candlestick patterns. As with any other method, this works only when the market is in a definite trend. 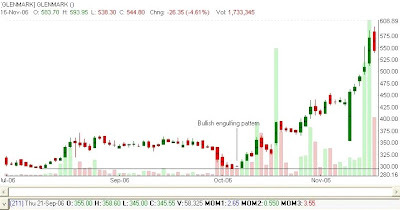 There may be hundreds of candlestick patterns occurring each day in the market but only few of them are relevant, since it is quite possible that a stock may be moving sideways, a bearish engulfing pattern may occur during the uptrend of a bullish pattern etc. and these are not true patterns. Identification of the successful pattern involves a little bit of in depth analysis. Candlestick patterns alone should never be used to initiate a trade. It is necessary to analyze all other parameters like support, resistance, momentum indicators, moving averages etc. before selecting a stock for trading.